Ralph Parkinson Crawford, was born January 8, 1925, in Logan Utah and was a member of the Snow Basin Ski Patrol before enlisting in the Ski Troops. In June 1943 he trained at Camp Hale, Colorado and later Camp Swift, Texas. He served in K Company, 86th Mountain Infantry Battalion, 10th Mountain Division and was discharged November 23, 1945. His battalion was instrumental in the offensive smashing enemy resistance in Northern Italy. PFC Ralph was awarded the Purple Heart, Silver Star, Combat Infantry Badge and EAME Medal with two Bronze Stars. After graduating from the University of Utah, he was a travelling auditor and worked in traffic for Mountain Bell. Later he was an administrator/liaison officer of the Telephone Pioneers retiring from U.S West after 37 years. He received the American Red Cross “Certificate of Merit” for saving the life of a two year old in July 1964. Ralph is a member of Lions International and served as District Governor of District 6C. He served on the Board of Trustees, Colorado School for the Deaf and Blind for 12 years. He married Carol Jean Vendell in 1950, also a graduate of the University of Utah and together they had three children. 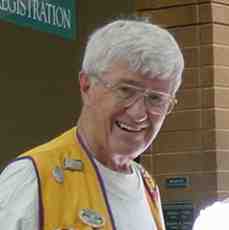 Ralph is an active member of the Highlands Ranch Lions Club.